Baltimore's death merchants Misery Index are in the studio, no doubt putting the finishing touches on their next groove-death masterwork. And band members don't have to kill time in the studio while other members are tracking their parts; they simply don't hang in the studio when not needed. Jason Netherton checked in with Noisecreep about the process. "We don't stay in the studio while the other person is tracking, unless we have some particular interest or reason for being there," bassist/vocalist Jason Netherton told Noisecreep. "For example, if Mark is recording or tracking guitars for a song I wrote, I would be there in and out to give the green light on the finished product. 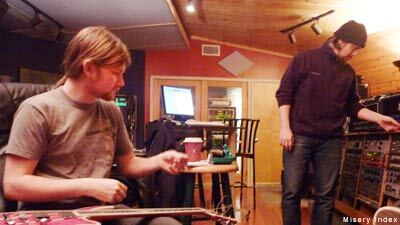 Or if Adam is tracking Mark's song, Mark will come in at the end of the session to review and approve of the take. So it's sort of a revolving door of members coming and going while songs are tracked, until mixing, when most all of us will be in there reviewing the songs." After the band wraps recording this follow-up to 'Heirs to Thievery,' the guys will hop on three-week tour. From the studio to the road is like from the overly greased frying pan right into a blazing bonfire, but we're talking about Misery Index here. Netherton said, "Certainly, anyone who knows Misery Index knows our love of the road and our desire to travel. And since we have been home since last summer, boarded up in our rehearsal space, writing these new songs, we are about ready to jump out into the fray again! Five months at home is like a decade in Misery Index years, so we need to get our tour fix on, ASAP!" Clearly, Misery Index have the process down to a science. Netherton has, in fact, dealt with mishaps while recording, when he was in fellow Maryland death metal band Dying Fetus. So he has his fair share of horror stories from past records. "The studio is itself a horror for most musicians, due to its clinical, stressful nature," Netherton said. "But of course it has its moments of spontaneous genius and error-born creativity. However, I do recall one moment of pure horror in particular from the year 2000. While Sparky and I were in Dying Fetus, we were recording the drum tracks to 'Destroy the Opposition,' at this studio outside Washington, D.C.
"We came in one evening after all the drums tracks were recorded to have the engineer tell us 'I can't find the drums tracks to the first song, 'Praise the Lord.' To which we responded with disbelief, 'What do you mean you can't find them?' Well, it turns out the engineer fellow lost the entire session on his hard drive somewhere, and we had to re-set up and re-track the drums, painstakingly trying to match the tones with the rest of the album, which added time and frustration to an already long and tedious session. So, as it is today, the drums to the first song on the album were done separately from the rest of the album, but as it seems, it still turned out OK."
The tour kicks off Feb. 19 in Poughkeepsie, N.Y.